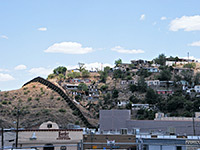 Nogales is one of five Arizona cities along the southern border with a crossing into Mexico, located at the south end of 63 mile Interstate 19 from Tucson. 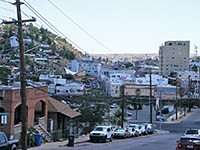 Nogales is somewhat smaller than the identically-named city over the border in Sonora; most residences are in the far south, either side of Grand Avenue, while shops, hotels and corporate locations are further north, in a generally less developed area. The main commercial center is Mariposa Mall, near exit 4 of the interstate. The city is situated in a valley, of a tributary of the Santa Cruz River, enclosed by hilly land to the west (Pajarito Mountains) and east (Patagonia Mountains), both part of the Coronado National Forest. One nearby attraction (15 miles along Hwy 82) is Patagonia Lake State Park, an artificial lake surrounded by pristine desert scenery. 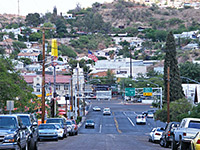 Nogales International Airport is located along this same road, 8 miles from downtown. Extended stay visitors to Nogales are well served by the new Candlewood Suites hotel (875 Frank Reed Road) - an all suite, 83 room property built in a quiet, hilly area on the north side of town, just off interstate 19 - access is from exit 4. The suites all have a full kitchen (microwave, stove, dishwasher, refrigerator), plus an extra sofa bed, DVD player and large work desk. There are various shops and fast food restaurants nearby, along Mariposa Rd, with plenty more choices in the center of Nogales 2 miles south. Other facilities at the hotel are a 24-hour market, fitness center, gift shop, pool and hot tub. The Holiday Inn Express hotel is situated 2 miles northwest of the center of Nogales, in a quiet, partly rural area, though still close to I-19 - the hotel is reached from exit 4, turning left along Mariposa Road then right along Frank Reed Road. The building is of older construction, with Mexican influences, and contains 99 oversized rooms and 20 suites (all with refrigerator/microwave) over three floors, a fitness center, outdoor pool, convenience store, gift shop and a recreation court. The usual free continental breakfast is served. Best Western Sonoran Inn is a 2009 addition to accommodation choices in Nogales - a handsome, three floor building on the northern edge of the city, beside I-19 exit 4 (Mariposa Road), close to several restaurants and stores. The 65 rooms are large, modern and well maintained, equipped with microwave, refrigerator, coffee/tea maker & hairdryer; some have a sofa bed and whirlpool bath. Hotel amenities include an outdoor pool, spa, fitness center, guest laundry and meeting space. Free full hot breakfast is prepared each morning. Formerly Americana Inn, the recently renovated Quality Hotel in Nogales is one of a number of properties along Grand Avenue in the town center, one mile from the Mexican border. Rates are fairly low and facilities quite basic - just guest laundry, an exercise room, meeting space and an outdoor pool, this latter in a secluded courtyard at the center. There are 97 interior corridor rooms available, some with a sofa sleeper, microwave and refrigerator. For dining the adjacent Mexican restaurant is open for breakfast, lunch & dinner. Right opposite the main shopping area in town (Mariposa Mall) along Grand Avenue, Motel 6 Nogales is a budget-priced, exterior corridor property with small but clean rooms, free coffee in the lobby, an outdoor pool, guest laundry and free wi-fi. Some rooms are available with a microwave and a refrigerator. There are many restaurants within walking distance, and the border with Mexico is 2.8 miles south.